Caption slip reads: "Photographer: Miller. Date: 1957-04-09. Reporter: Tarpley. Assignment: Maid of Cotton, Pepperdine College. 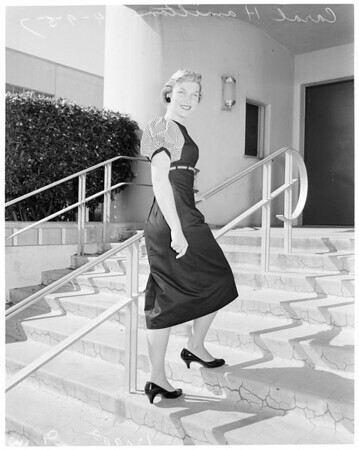 5/6/105: Various shots on steps, Carol Hamilton, 19, chosen as representative of Pepperdine in regional Maid of Cotton contest in May. 106/27/28: Carol Hamilton, Pepperdine's Maid of Cotton, in sports car".